NEW YORK CITY – May 24, 2017 – On June 4, 2017, the inaugural World Ocean Festival, organized by The Global Brain Foundation and hosted by the City of New York, will feature leading marine biologists, ocean advocates, entrepreneurs, and more speaking at a free, public program called World Ocean Festival Speaker Forum sponsored by National Geographic Encounter: Ocean Odyssey. The Festival is an effort to bring together people and organizations who care deeply about the Ocean and who will stand together for its protection in advance of “The Ocean Conference” at the United Nations (June 5-9). “We are thrilled to have all of these incredible voices of the ocean coming to join us at Governors Island on June 4,” said Natalia Vega-Berry, Founder and Executive Producer of World Ocean Festival and The Global Brain Foundation. “World Ocean Festival is merely providing the moment for people and organizations to stand together for the ocean in advance of the UN convening to show world leaders how strongly we feel. “We depend on the ocean for everything from the food we eat to the air we breathe,” said Maria Damanaki, Managing Director for Oceans at The Nature Conservancy. “Now more than ever, the future health of our oceans depends on us. It is exciting to see the United Nations call on governments, NGOs and citizens to commit to protect the ocean and ensure that it will continue to provide for us and for generations to come echoed by this Festival and met with global support." National Geographic Encounter: Ocean Odyssey is a first-in-kind immersive entertainment experience that transports audiences on a jaw-dropping, never-before-seen undersea journey. Developed by a team of Academy, Emmy and Grammy Award-winning creative minds, National Geographic Encounter harnesses groundbreaking digital technology to create a completely new kind of entertainment experience that enables visitors to explore the depths of the Pacific Ocean and come face-to-face with its greatest wonders and mightiest creatures. National Geographic Encounter opens October 2017 and is located in the heart of New York City’s Times Square. The City of New York and The Global Brain are joined by leaders in ocean conservation, advocacy, and sustainable development our Founding Partners Mission Blue, Ocean Elders, Oceanic and The Nature Conservancy. This event is made possible by support from Founding Sponsor Toyota USA, creator of the Mirai fuel cell vehicle and National Geographic. 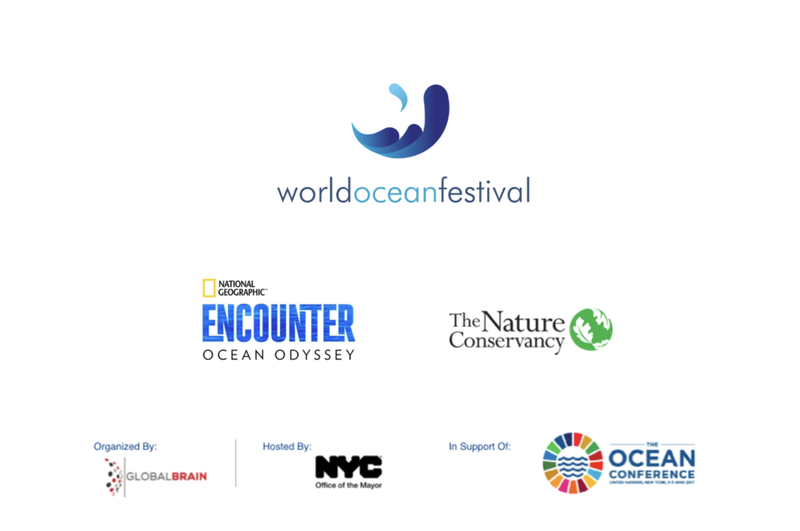 Core Supporters of the World Ocean Festival include Peace Boat, Connect4Climate, Ocean Collectiv and NGO Committee of Sustainable Development-NY. Additional supporters include: Classic Harbor Line, Conscious Good, Ocean Film Festival, Style & Resilience, TerraCycle, Waterkeeper Alliance, AEFocus, Connect 4 Climate, NGO Committee of Sustainable Development-NY, Metcalf Institute, Sustainable Ocean Alliance, We Are The Oceans, Clean Seas, Bye Bye Plastics, Monterey Bay Aquarium, National Educators Association, Mukaro, RiseUP, Blue Mind, The Foundation Center, Waterfront Alliance, Sailors for the Sea, Earth Day Network, The Lonely Whale Foundation, Sea Youth Rise Up, Guy Harvey Ocean Foundation, Blue Ocean Network, Second Muse, Wildlife Conservation Society and NYC Junior Ambassadors. The Global Brain Foundation is a 501 C3 not for profit corporation. Our mission is to create new initiatives and ventures to tackle issues where mass participation and collective action can unlock big change. Our current initiatives are in support of the United Nations 17 Sustainable Development Goals and new climate agreements. To learn more, visit: http://www.globalbrain.is/.